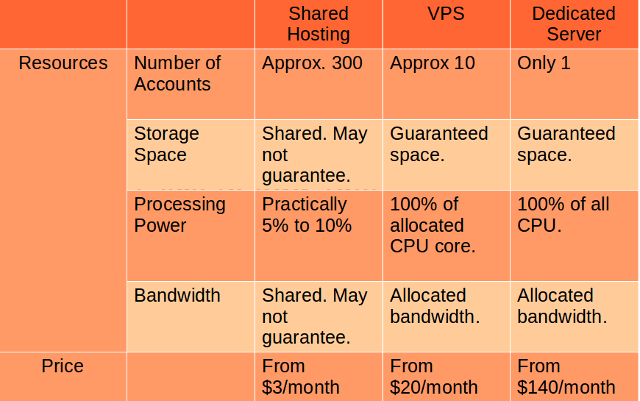 Shared hosting vs VPS vs Dedicated server at a glance. Compare shared hosting, VPS and Dedicated server. What is dedicated server ? Dedicated server is easy to understand, it is your own server, entirely, you get 100% of whatever it has – CPU, Bandwidth, RAM, HDD space. everything. You can have root access of it and customize it the way you want it. What is Virtual Private Server ? VPS or virtual private server hosting is the next level of hosting above shard hosting. This type of hosting still puts your websites on the same server as many others, but in a different way. Instead of the “first come, first serve” format of shared hosting, your websites will be hosted on a partition of the server with assigned resources for you only. Each virtual private hosting server behaves exactly like a dedicated web server and its resources are guaranteed, including the central processing unit usage, RAM and server space allowances. These system resources are much higher than those furnished by any shared web hosting package, so a Virtual Private Server is the most clever choice for high resource-swallowing script-powered sites with lots of visitors, or if you desire to host a large amount of domains in the same account. What is Shared Hosting ? Shared hosting is usually the budget form of hosting plan you can get online, check out our top web hosting list. It is called shared hosting because the server resources are shared by a large number of customers. Different web hosting companies offer shared hosting plans with different features. Shared hosting is cheap because the cost is shared by a lot of webmasters. Usually, a shared hosting server is allotted to a few hundreds account. It is suitable for individuals and businesses who want to host websites with small to medium traffic. Shared hosting is fully managed by the web host. This means that you don’t have to perform any maintenance job on the server. The web host is responsible in handling all the issues that arise on the server. Most shared hosting plans provide control panel applications for webmasters so that they can easily perform the regular chores of their websites.